A year ago the financial industry bemoaned the fact that Americans had a -1% in savings. Today I saw on CNBC two talking heads speak about how we shouldn't be saving (we are up to 1-2%) and should be spending money. Well phooey, I think saving money is goo d in any economy. However, saving money can be hard if it isn't a habit you are used to, so I have gathered some simple ways to save money by "tricking yourself" into saving it. It's kind of like setting your alarm clock 5 minutes ahead. Scrape off the Top: If you have direct deposit this is easier, but it can be done if you cash your paychecks as well. Have the bank or yourself, scrape off the first $25 or $50 (or whatever amount) into a savings account immediately before you spend your money on anything else. Don't Keep "Found" Money: For every rebate check you get back, for every IRS refund or bonus that you weren't expecting; don't spend it. Bank it for your saving account and save for an emergency. You weren't figuring that money into your income anyway, so don't keep it around to be spent. 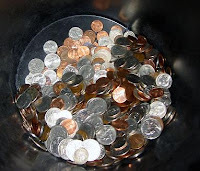 Cover it up: I have noticed that I dip into the glass "loose change" jar for money more often than I do with the tin container. Why? I'm sure some psychology major can explain the thinking better than I, but I think it is because I can see the money in the glass jar and can't in the tin container. I have read of people who hid money out of sight and then forgot about it until their children or the new home buyers find it. Out of sight, out of mind. Bad Habits, New Savings: The above hack can also be used for the time that comes when you drop a bad habit. If you went out and spent $30 a night on drinks at the club but don't go now or if you used to buy two cartons of smokes a week and now you are down to one, use that extra money to improve your savings. Same money spent, just better returns. When I grocery shop once a week, I pay with my debit card (so I can track expenses easier) and get $20 cash back. I squirrel that cash away for a rainy day or random expenses that pop up. That is great, does your bank have some sort of incentive to use your debit car? Wow I never thought about savings in this way, especially my baseball cards and comic book collections. They are just collecting dust in my parents attic. Also great idea to roundup in the checkbook, I need to start doing that myself! When I was working two jobs for a short time, I put all the post-tax money of the second job in my emergency fund. It was only a short-term job, but it did help grow the fund and since I wasn't used to the extra money (even though it was only a little bit), it wasn't missed in my pockets. I save all 50 cent commemorative coins that come my way and have a rule that all cheques go to pay off the home loan - luckily my wages are directly deposited into the bank account. Great "hacks" everyone. I will definately be putting some of these to use.